We had problems finding Sandy Cove beach. There's no sign on Marine Drive saying "Sandy Cove Here". What you see is a bunch of cars parked along Marine Drive around Rose Crescent. We picked the wrong time to go; the tide was in and there was no sand to be seen at Sandy Cove beach. We didn't stay long, because without the sand there wasn't much to do. And as Jen put it, "this beach is puny." Sandy Cove beach is only about 100 metres wide in all, which makes it perfect for little kids and people gazers but boring for older children. Although I did see some older boys having fun jumping from the rocks when the waves splashed up. Sandy Cove (bird's eye view) is a quaint beach tucked away between two rock headlands. The sun shines for a long time and it's good for keeping an eye on young kids--they don't have far to run or crawl. No matter where they go, they're always in your sight. Nathan, our nine year old, found Sandy Cove beach a little "lame". No corners to round and lose mom and dad for awhile. The parking is very sparse on Marine Drive, but you can park on Rose Crescent which intersects Marine Drive. 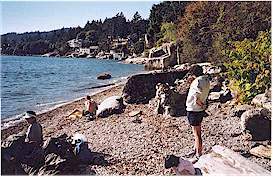 To get to Sandy Cove beach, drive west on Marine Drive about a mile or two past Dundarave Beach, until you see a small bridge and a street called Rose Crescent. Park your car on Marine Drive or Rose Crescent, then go underneath the bridge, and following the very short trail to Sandy Cove beach. The water view is sensational. Huge freighters are some times anchored off the beach, speed boats, sailboats, kayaks, and Stanley Park and Point Grey across the water. We had fun exploring a new beach. I'd like to go back when the tide is out and see what Sandy Cove beach is really like.